Spend a night in comfortable Swiss tents at a beautiful campsite in Mysore and enjoy a fun holiday with your family or friends. The campsite offers a range of exciting group activities, from outdoor sports like football or cricket to indoor games like carrom or board games. You can also head out to explore local attractions in Mysore like the Brindavan Gardens or the Mysore Palace or simply relax at the campsite and take a dip in the swimming pool. In the evening, enjoy an outdoor movie experience with your fellow campers and end the day around a crackling bonfire. Posing as the perfect weekend getaway, this camping trip in Mysore is a great escape for travellers near Mysore looking for a short escape from the city. Your campsite is located near the village of Hadjana, accessible via a 15-min drive from Mysore city center. With a large open ground decorated by monsoon greenery, this campsite is a great option for a weekend escape or spontaneous getaway. The campsite hosts a swimming pool for relaxing evenings and a large movie screen for a fun night with your family. 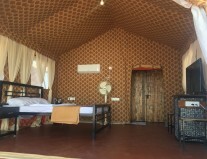 For a comfortable camping experience, you'll be staying in Swiss tents, equipped with an air-conditioner, a comfortable bed with blankets and pillows, an attached washroom, a bedside table with chairs and cupboard. Delicious buffet meals will be served at the common dining area. • Spend a night in Swiss tents pitched at a spacious campsite. For cancellations made 7 days or more before check-in date of the Swiss tent camping trip in Mysore: 100% refund. For cancellations made 6 days before check-in date of the Swiss tent camping trip in Mysore: 80% refund. For cancellations made 5 days before check-in date of the Swiss tent camping trip in Mysore: 60% refund. For cancellations made 4 days before check-in date of the Swiss tent camping trip in Mysore: 40% refund. For cancellations made 3 days before check-in date of the Swiss tent camping trip in Mysore: 30% refund. For cancellations made 2 days before check-in date of the Swiss tent camping trip in Mysore: 15% refund. For cancellations made 1 day before check-in date of the Swiss tent camping trip in Mysore: 10% refund. For cancellations made on the check-in date of the Swiss tent camping trip in Mysore: no refund. There is no pick-up for this Swiss tent camping trip in Mysore. There is no drop-off for this Swiss tent camping trip in Mysore. Day 1 of Swiss tent camping in Mysore: Check-in and enjoy! Arrive and check-in at the campsite any time after 12:00 hrs. Have a delicious lunch and spend the day at leisure. The campsite offers a range of activities, from outdoor sports like football or cricket and indoor games like carrom or board games. You can also head out to explore local attractions in Mysore or take a dip in the swimming pool. In the evening, enjoy an outdoor movie experience with your fellow campers, have a buffet dinner and end the day around a crackling bonfire. Overnight in Swiss tents at the Mysore campsite. Overnight in Swiss tents at Mysore campsite. Check-in time at the campsite is 12:00 hrs. Today's meal package includes lunch and dinner. One non-vegetarian dish will be available during the lunch or dinner buffet. The access timings for the swimming pool and common play area access range from 06:00-20:00 hrs. You'll be accommodated in Swiss tents, equipped with a bed with blankets and pillows, air-conditoner, attached washroom, bedside table, chairs and cupboard.